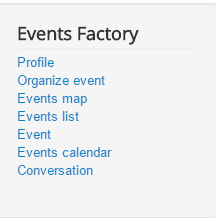 To manage the events on your site, you can go to Events page in the backend. Here are displayed all the events in a list containing basic information about them. Title, Organizer, Location, "Starts at", "Ends at", Bookings, State. On this page you can view all the fields displayed on the frontend and allows you to edit them if needed. As administrator, you can change the State of an event from draft to published or you can cancel it. Note that if you select to approve the events before publishing (from the Configuration page), then the events will remain in pending/ submitted status in the Approved column and will not appear on the site until you switch it to accepted or you can reject it. Also you can change the event’s organizer if you wish. * Registration start date: The users will be able to register to the event starting with this date and hour. * Registration end date: From this moment, the registration ends for this event. * Start Date: The date and hour of the event. After this date, users will no longer be able to register for this event. * End date: The date and hour when event ends. * Publish date: The date and hour when the event will be available on the site. 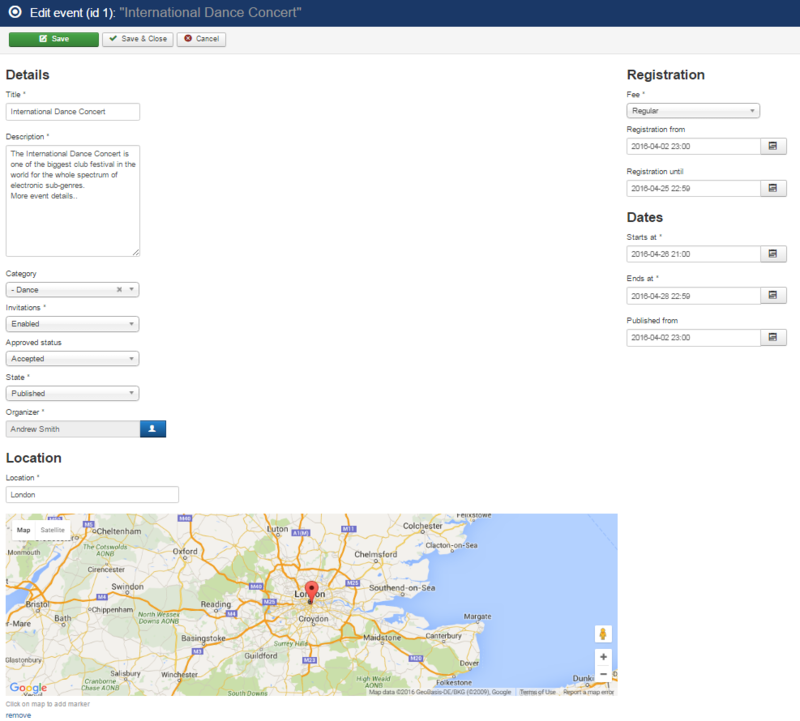 Access the Registrations section to see the participants for each event. You can export a CSV file with the participants Name, Email and the booked Event. 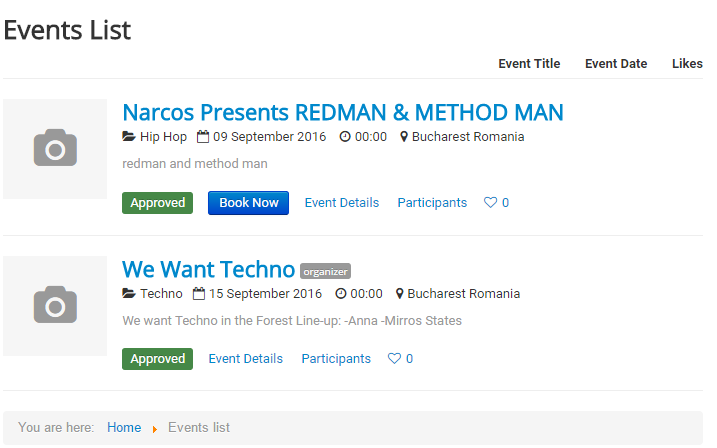 On this page you can see all the organizers from your site, including the number of published events for each one and the maximum allowed. Here you can reset the organized events for each organizer and set the value to 0, which will allow him to publish again the maximum number of events. As for registration, you can set the entrance fee for the event(you can set it to either free, regular or tier) and it's start and end date. The Events Map displays a map with upcoming events.